"My wife and I began looking for our first house in the fall of 2008. We are extremely thankful we stumbled upon Dawn Maloney when we emailed her about a listing she had. The house she was listing had just sold but she was so helpful that we decided to meet with her and see what else she could do for us. From the beginning Dawn was a true professional and we felt very comfortable with making her our agent. Dawn was more than patient with us as we looked at house after house. She was a wealth of knowledge about what to look for when purchasing a home and happily answered any question we had. She was flexible with our work schedules so that everything was convenient for us. When we finally found the house we wanted, the seller's bank delayed the process for nine months due to a short sale. Dawn was our greatest advocate and went through every avenue possible to help us get the house even when it seemed impossible. Through patience and perseverance, we finally received our acceptance! Dawn guided us through the closing and helped make it as smooth as possible. We would highly recommend Dawn to anyone in search of a real estate agent." I have years of experience, and I care about what you want and need. I'm here to make sure you can accomplish your real estate goals. •Personal attention for each client. •"Exquisite Service" 200 Pt. Plus Marketing Program. •Unmatched web presence for your home. •Superior service for all your real estate needs. •Average Days On Market for My Listings: 49 days!! •Licensed Short Sale Trainer with www.AmericasHomeRescue.com. Bank of America’s Newest Short Sale Deal Killing Tactic: "FAIR Market Value"
Alert! 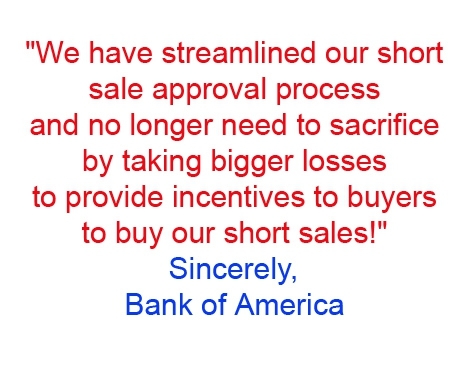 Bank of America's Newest Short Sale Deal Killing Tactic: "FAIR Market Value"
You may be in for a shock. The latest strategy is a real deal killer and appears to be happening all over the country in recent days. As we are wrapping up 2010, a review of the year finds me shaking my head. Facebook Friends = Short Sale Help!